Horse Island is a small island located only one kilometre offshore from Ardrossan (NS 213 427). Despite its diminutive size (20 hectares including 13 hectares of inter-tidal zone), it has been recognised since at least the 1950’s as an important island for breeding birds. In addition to various inter-tidal habitats, there are several brackish pools and areas of dune grassland which add to the interest of the site. The RSPB have managed the island as a Nature Reserve since 1961, it having achieved the designation of Statutory Bird Sanctuary in 1963. Management is mainly through monitoring, non-intervention and minimising disturbance. RSPB staff and volunteers make an annual visit to the island in late May to survey the breeding birds, with occasional visits later in the season. Since 2001, the Clyde Ringing Group have carried out ringing activities on site. There are no visiting facilities and there is no access during the breeding season (March – September). Out with that period, written permission to visit the island must be sought from the RSPB at Lochwinnoch Nature Reserve (telephone 01505- 842663, e-mail Lochwinnoch@rspb.org.uk). Calm sea conditions are an essential prerequisite to visiting the island, as landing is somewhat precarious! Relatively good views of some of the birds around the island can be obtained from the Ardrossan – Brodick Ferry. Over 60 species have been recorded on the island with over a third of these having bred. Historically, Horse Island was an important ternery, with five species of tern having bred there. Peaks were 267 pairs of Common Tern and a similar number of Arctic Tern (1961), 15 pairs of Roseate Tern (1970), 574 pairs of Sandwich Tern (1975) and two pairs of Little Tern (1977). Few terns have bred since 1984, and there has been no breeding since the final pair of Common Terns recorded in 1996. In harsh weather, there was also an important roost site for Greylag Geese , with a peak of 2,000 in 1979. Currently, the island is famed for breeding gulls and Eider . Of the three principal gull species breeding there – Lesser Black-backed, Herring and Great Black-backed – the former has established a nationally important colony. In total, usually over 2,000 pairs of gulls breed. Eider numbers are also very healthy at the site, with 542 pairs breeding in 2002, making it a regionally important site. A Cormorant colony was established in 1996, and this included 73 nests in 2002. A lone pair of Shag nested in 2001 (constituting the first breeding record for the island), however it was suspected that the nest failed as no young were seen on a later date. Other regular breeders have included Mute Swan, Greylag Goose, Mallard, Moorhen, Oystercatcher and Rock Pipit . Occasional breeders have included Barnacle Goose, Carrion Crow and Raven – the latter breeding on a ledge on the Beacon Tower for the first time in 2002. Out with the breeding season, 13 species of wader have been recorded on passage including Whimbrel, Black-tailed Godwit and Greenshank . Passerines recorded have included Redstart, Wheatear, Linnet and Snow Bunting . One might speculate that Twite and Snow Bunting are more frequently found on the island in autumn and winter than records would dictate, but go un-recorded. Given the regular sightings of Black Redstart further north at Seamill, there is similar suitable habitat to be found on Horse Island. The excellent Whispers of Horse Island by John & Noreen Steele (Argyll Publishing, 1999, ISBN 1 902831 055) provides a comprehensive history of the site, complete with illustrations and photographs, both historical and contemporary, and is available from Lochwinnoch Nature Reserve Shop. 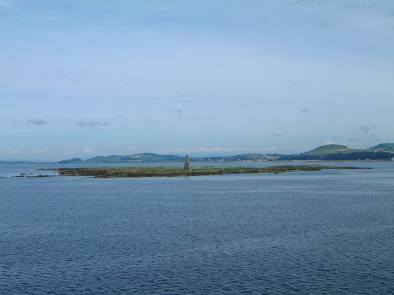 Copies of the Horse Island Management Plan are available to consult at Ardrossan and Saltcoats Libraries, or alternatively, at Lochwinnoch Nature Reserve. The Horse Island Breeding Bird Report is published annually, the latest copy available from Lochwinnoch RSPB Nature Reserve.